Music, it is said, is a combination of two contradictory forces — that which cannot be put in words but cannot remain silent either. The old Bollywood numbers are playing on everyone’s lips even in this day of dhin-chak music. So it wasn’t a surprise to see young and old gather at an auditorium in the City recently to pay tribute to music director R D Burman. When the legend reigned the industry, bland musical beats took the shape of groovy, peppy numbers and upbeat rock ‘n’ roll. Nostalgia played on at the Good Shepherd Auditorium that day even as music spelt ‘Pancham’. Zansam, a musical group who swear by this maestro’s line of music, strung out a thread of melodies picked up from the early 70s to 90s. The instrumental theme of Sholay followed by the memorable Musafir Hoon Yaaron enlivened the mood. The soulful numbers, Mere Naina Sawan Bhadho and the track Tum Aa Gaye Ho by lead vocalist Prahalad created a stir in the auditorium as people couldn’t stop appreciating the talented singer. Ek Ladki Ko Dekha Toh… pepped up the mood as Aniket, the other lead vocalist, emoted the song well. Vocalist Rujuta moved the audiences with her Ghar Aaja Ghar Aaye and Kya Jaanoon Sajan. The latter part of the evening saw many foot-tapping numbers such as Ek Chatur Naar, which was safe in the hands of vocalists Tushar and Aniket. The harmonica magician, Abel left the audience spellbound creating the melodious, Hai Apna Dil Toh Awara with his mouthorgan. Seasoned with contemporary colours, these musicians are a band of 13. Their own composition Udne Do summed up the purpose of the evening. 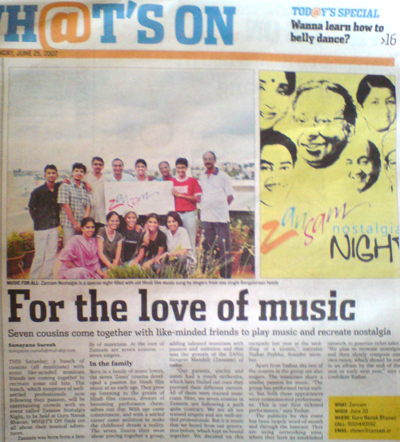 Defining it as ‘Music for a cause,’ Zansam dedicated this concert in aid of Socare Ind, an organisation working for the welfare of convicts’ children. This Saturday, a bunch of cousins(all muscisians) with some like-minded musician friends are coming together to recreate some old hits. The bunch, which comprises of well settled professionals now following their passion, will be entertaining crowds with an event called Zansam Nostalgia Night, to be held at Guru Nanak Bhavan. WH@T’S ON finds out all about their musical adventures. Zansam was born from a family of musicians. At the core of Zansam are seven cousins-seven singers. 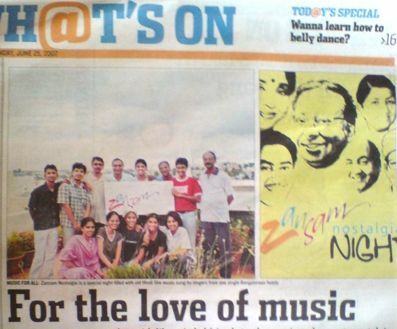 Born in a family of music lovers, the seven Zanzi cousins developed a passion for hindi film music at an early age. They grew up listening to the greats of hindi film cinema, dreamt of becoming performers themselves one day. With age came commitment, and with a settled career came ambition to make the childhood dream a reality. The seven Zanzis then went about piecing together a group, adding talented musicians with passion and ambition and that was the genesis of the ZANsi SAngeet Mandali (ZANSAM) of today. “our parents, uncles and aunts had a youth orchestra, which later fizzled out once they pursued their different careers. All of them were trained musicians. Here, we seven cousins in Zansam are following a path quite contrary. We are all not trained singers and are well-settled professionals. But it is music that we heard from our generation before, which kept us bound together. We decided on this escapade last year at the wedding of a cousin.”, narrates Tushar Prabhu, founder member. Apart from Tushar, the rest of the cousins in the group are also singers. The musicians share a similar passion for music. “the group has performed twice earlier, but both these appearances were commissioned performances.” , says Tushar. The publicity for this event has been largely word-of-mouth and through the internet. They are using networking sites, where they have an established network, to generate ticket sales. “we plan to recreate nostalgia and then slowly compose our own tunes, which should be out in an album by the end of the year or early next year.” , says a confident Tushar.